Electrical Walks - "With special, sensitive headphones, the acoustic perceptibility of aboveground and underground electrical currents is ... amplified.... The perception of everyday reality changes when one listens to the electrical fields; what is accustomed appears in a different context. Nothing looks the way it sounds. And nothing sounds the way it looks." Carsten Nicolai produced a normal CD designed for the audio signal to be fed directly into a television from a CD player. His work often focuses on the relationship between audio and visuals. Sawako created sounds using the 2.4 GHz spectrum used by WiFi, bluetooth, microwave ovens, cordless game controllers, etc. "Our world is resonating with various kinds of waves, and the waves make harmony in the air. Human beings can catch the very limited signals of waves with their ears and eyes and use them for their communication. Like some fishes living in the standing river communicates with electromagnetic wave, with radio frequency technology, people expand the ways of communication using signals and the range of the frequency used for the communication. Even though we don't realize, we are surrounded with the invisible signals like you are living in the invisible sound of ocean." "Cell Phone Disco is an experimental installation made out of flashing cells. By multiplication of a mobile phone gadget, only slightly altered consumer product, we created a space to experience the invisible body of the mobile phone." "Humans have only recently begun contributing to the cacophony with their pagers, medical devices, television broadcasts and mobile phones. This abundant invisible territory, a topography that is altered in shape and intensity by both natural and human-constructed landscapes, has been called 'hertzian space' by industrial design theorist Anthony Dunne. He has observed that hertzian space is often ignored by designers saying, in Hertzian Tales, that the 'material responses to immaterial electromagnetic fields can lead to new aesthetic possibilities for architecture.'" 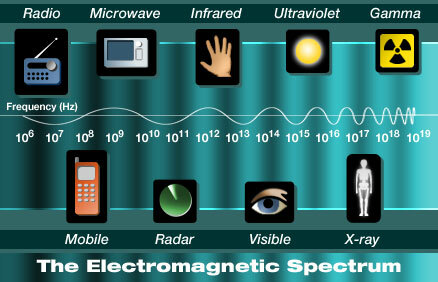 Since the invention of radio, larger and larger portions of the invisible electromagnetic spectrum are being used to transmit data. With the increasing saturation of electronic devices, an awareness of the invisible magnetic fields they produce is important to understanding our environment. These man-made and natural waves create an invisible "hertzian space." These invisible data structures can be recaptured and recontextualized as "art." An epiphany occured when I stumbled across lessemf.com - "The EMF Saftey Superstore". At first glance a seemingly normal electronics company based in Albany, NY, selling a wide range of EMF detectors from $5 - $2500, the company markets a number of the EMF detectors as "ghost hunting equipment". They also sell EMF Safety Garments including EMF-shielding undergarments, long johns, socks, and baseball cap. Less EMF, Inc. also sells many books, including Living Without Electricity and HAARP: The Ultimate Weapon of the Conspiracy. At the same time they sell a book for children entitled Safe & Simple Electrical Experiments. This indicates to me that although EMF-producing devices are becoming ubiquitous, there is still a large sense of mystery, fear, and paranoia surrounding these invisible fields. Do cellphones cause brain tumors? Can we communicate with the dead? What about the spiritual aspects? Is the government trying to control my thoughts? and so forth. excerpt from an email from Tom Igoe to "Physical Computing at ITP"
> I try messing with this? normal mic. It has nothing to do with the radiation. Not so! The pickup does not respond to sound, but contains an inductor coil which allows you to hear changing magnetic fields. The way it picks up a telephone conversation is through inductance from the speaker. What tipped me off that this detector might work is that the "magentic pickup" for sale on the Less EMF website looks remarkably the same as the "telephone pickup" sold at Radioshack. Strangely enough, no one seemed to think this would work- including the knowledgeable employees at Radioshack. The moral of this story is that sometimes if you ask people for advice, they will give you the wrong advice, even if they are experts. Incidentally, Less EMF markets the "magnetic pickup" as an EVP (Electronic Voice Phenomenon) Listening Device. Spoooky. Once I got the detector working, my original intention was to have two detectors hooked up to stereo headphones alá Kubisch. The problem with this is that the detector isn't sensitive enough; the EM fields drop off rapidly, so unless the detector is within a few centimeters of a device, nothing but a soft electrical hum is detected. Since the detector produces sound, it is simple to produce a visualization. 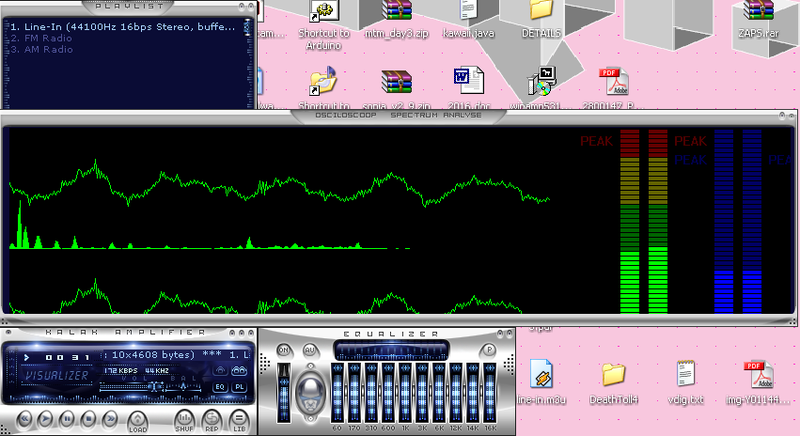 Using Winamp with a Line-In plugin allows me to use all the trippy visualization plugins designed for Winamp. Here I am using the simple Oscilloscope and VU Meter. One constraint is that the more I want to represent visually, the less portable the device becomes. A handheld oscilloscope costs $100. Visualizations could be loaded onto a Blackberry or other PDA. But for more interesting visuals a desktop/laptop is probably needed. Could the project be a portable device that plugs into an installed projector piece? Could two detectors be used to create a three dimensional representation of electromagnetic vector fields? More complicated sounds than buzzing could be created using frequency modulation (FM synthesis). With two detectors, one detector could modulate another. Non-screen based visualization using LEDs, solenoids, water waves, television interference, etc. Detector which responds to fields by reorienting itself.